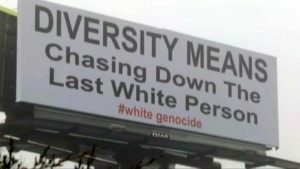 If you’re white and don’t support White Genocide by mass third world immigration and forced integration/assimilation in EVERY white country and ONLY in white countries, you’re a naziwhowantstokillsixmillionjews! We don’t need to become scholars and harangue our white audiences with critiques of anti-whites’ versions of history (why would we expect an audience that’s ignorant of the facts and not very interested in history to accept our account rather than our enemy’s?) — that just leads to endless argument. But an audience that knows nothing does know that nothing justifies genocide. Our job is to show, to all whites who are watching, that the anti-white does in fact support White Genocide, whatever the anti-white’s justification for White Genocide is. Nothing justifies genocide. Okay, let’s get to the news item this article is supposed to be about, which not only shows how anti-whites use the Nazi narrative to justify White Genocide, but also shows what a government that cares about its people, as Viktor Orban’s government in Hungary does, can actually do to maintain that people. Women who have given birth to and raised four or more children will be exempt from personal income tax for the rest of their lives. Click on the billboard to watch a News video about it. Strandhall’s tweet started a little diplomatic dance — Hungary’s foreign ministry summoned the Swedish ambassador to complain about the tweet, and then “Hungary’s ambassador to Stockholm, Adrien Muller was summoned to the Swedish Ministry of Foreign Affairs, after Deputy Prime Minister [of Hungary] Zsolt Semjen called Sweden’s Minister of Social Affairs Annika Strandhall a ‘poor, sick creature’” on a television show. She is a poor, sick creature. White self-hatred is SICK!!! 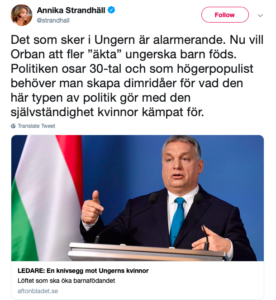 Hungarian Secretary of State for Family and Youth Affairs, Katalin Novak wrote a letter to Swedish Minister for Social Affairs Annika Strandhall, after the left-wing politician compared Hungary’s pro-family action plan to Nazi Germany. “We respect the decision of the Swedish government that you consider the integration of immigrants and their family reunification a top priority and that migration is your answer to the demographic challenges,” Novak stresses, adding that “even if we do not share your approach, we respect the right of Swedish citizens to democratically choose their political leaders and the government’s freedom to take internal decisions in a democratic way. That is what we offer and require from our partners”. There’s a silver lining when these “Nazi! Nazi! Nazi!” scum-bags get to screeching: Every time they come off with “That’s what Hitler and the Nazis did!”, White people are forced to concede, maybe only in the backs of their minds, that Hitler and the Nazis actually gave a damn about their race. And that alone is a huge red-pill. To oppose modern-day “Nazis”, you must truly believe that it’s not o’kay to be White. Which logically means that there are a whole lot of White people, no matter how much they virtue-signal, who, in their hearts, do NOT oppose we modern-day “Nazis”. Seeds are being planted every time some anti-White shrieks “Nazi” or “literally Hitler” at someone or something that doesn’t cause HARM to our race. Hungary is proper. This is the correct course of action in correcting a low birth rate, NOT immigration from the 3rd world. White European people are the TRUE people of color, red-orange hair, green eyes, blue eyes, and blonde-yellow shades of hair. What does the rest of the world have? Merely brown hair and brown eyes. Diversity is an oxymoron when used by anti-whites. The true people of color are white Europeans!! Fine article today from ABC News! Viktor Orban and his Hungarians are standing strong against White Genocide in Europe!